If you've ever wanted to create a database for all your music using a computer, but took one look at MS Access and realised that although it's powerful, it's aesthetics and specific functionality are utterly crap, then you've found the right place. 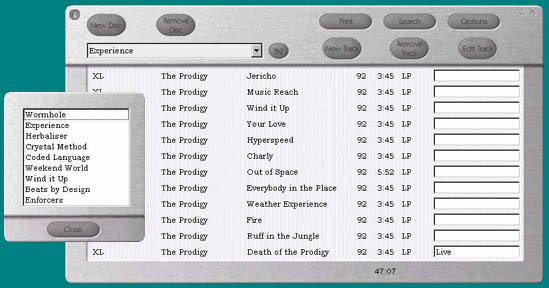 Here you can download my database program, written specifically for cataloging vinyl onto Minidisc, which should help you keep control of your collection. 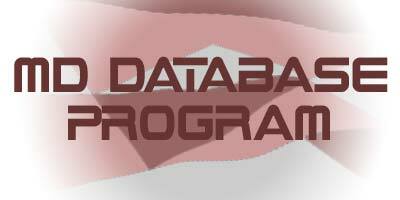 The program offers room for the record label name, artist name, track title, the date, the length of the song, the format and a comment. 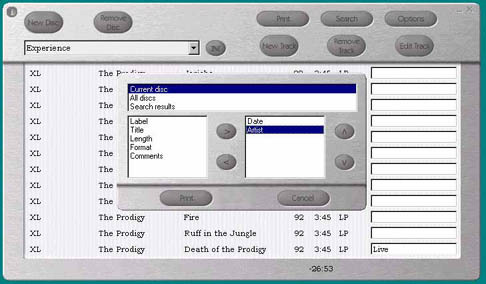 You can set disc lengths, and calculate disc time remaining, and it will now easily support many more discs with the new navigator - whilst still providing full printing capabilities and searching functions. And it has a nice modern graphical interface, as you can see from the screenshots below. Above shows the new disc navigator and below you can see the printing dialog box. If you haven't got a copy of Visual Basic 6 on your machine you will need to download and run the following installer. This will install the system files your computer needs to run MD v2.7.